Senior Vice President, Leasing, B.C. Jeff Rank joined QuadReal as Senior Vice President, Leasing, BC in February 2017. In this role, he oversees all leasing activity for BC office and industrial assets as well as pre-leasing activity for new developments. 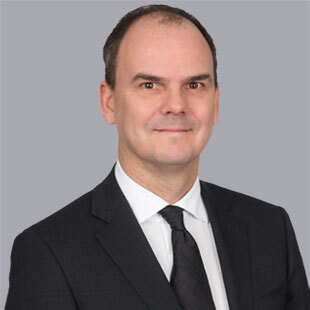 Jeff brings 29 years of real estate experience to QuadReal, having most recently held the position of VP of Project Development, Marketing and Leasing with Bentall Kennedy, where he was responsible for leasing a significant office and industrial portfolio including BCI’s 745 Thurlow and Broadway Tech Centre developments. Jeff’s prior experience includes Managing Director at Cushman & Wakefield in Vancouver, and VP Leasing at Bentall Real Estate Services. Jeff obtained a Marketing Administration Degree from Seneca College, and contributes to the ongoing professional development of commercial real estate professionals with the BC Real Estate Association in both a consulting and a teaching capacity. He served on the Board of NAIOP’s Vancouver Chapter as Chairperson, President and National Director over a span of 14 years, and frequently volunteers at the Union Gospel Mission. Jeff values working with a results-oriented QuadReal team that will continually strive to deliver strong investment returns to BCI’s pension plan clients.